Current UK Women's Forum Board. Photo by Sarah Caton. LEXINGTON, Ky. (April 10, 2019) — The University of Kentucky Women’s Forum is seeking board members for the 2019-2021 term. Women's Forum is an organization for all employees of the university, both faculty and staff. 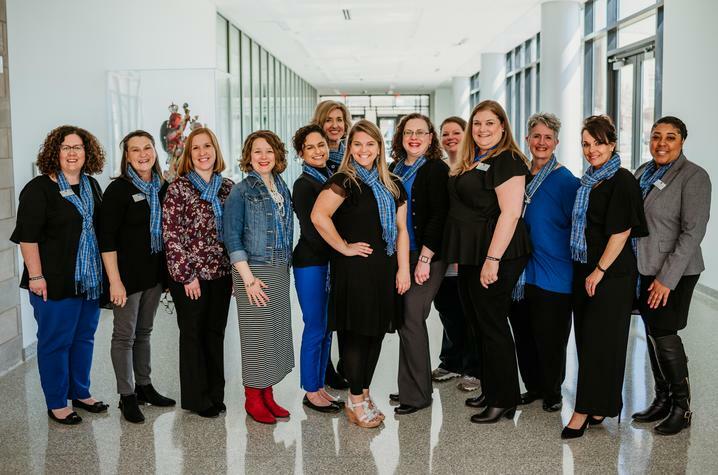 Its mission is "to exert leadership in empowering, validating, informing, including and celebrating all women employed at the University of Kentucky by addressing challenges, communicating issues and recognizing successes within the context of the workplace." Nominations for the Women's Forum board are open now through April 26, 2019. Self-nominations are welcome from any employee interested in championing women’s issues at UK. Alternatively, you may reach out to someone else you think would make an excellent candidate and encourage them to self-nominate. The nomination form can be found at https://uky.az1.qualtrics.com/jfe/form/SV_dfXq0QE9cC1wtXT. Specifically, the Women’s Forum is looking for individuals who can contribute a variety of skills and experience including event planning, fundraising, communication, social media marketing, website design, public relations and program development. Every board member has the opportunity to grow and develop their leadership capacity while serving in the board member role. Being among outstanding women and men who dedicate themselves to making UK a better place to work. Enhancing leadership and teamwork skills. Participating in networking opportunities with a diverse group of individuals. Celebrating the uniqueness of all women at UK. Continuing the success of our long standing Sarah Bennett Holmes Award and Luncheon. Developing new contributions to the annual Women’s Forum Conference. Participating in the Employee Educational Assistance Awards program, which bestows scholarships for continuing education among UK employees. Nominees will be placed on a ballot for campuswide voting during the UK Staff Senate elections May 6-24, 2019. Those elected will serve a two-year term beginning Tuesday, June 18, at the all-day Women’s Forum board retreat. Nominations should include a 250-word platform statement and picture. Additional details regarding member expectations can be found on the nomination form. Any questions about the election process may be directed to current UKWF Chair-elect Amanda Saha at amanda.saha@uky.edu.